NFL SUNDAY TICKET is returning in time for the NFL‘s regular season opening weekend on September 9th. All existing DIRECTV subscribers who have the NFL SUNDAY TICKET MAX plan will be able to download the PS3 application from PlayStation Network for free, and live stream every out-of-market NFL football game every Sunday afternoon this season in full HD. In addition, you will have access to DIRECTV’S the RED ZONE CHANNEL at no additional charge. RED ZONE delivers the final yards of every scoring drive and other exciting moments from all Sunday afternoon games as they happen, and it’s a great way to stay on top of the day’s highlights. For all of you fantasy football aficionados, the NFL SUNDAY TICKET app also includes up-to-the-minute stats to help you keep track of every play on the field. If you play NFL.com fantasy, you can follow your fantasy team in real time while watching games Sunday afternoon. PS3 owners without access to DIRECTV will also be able to receive NFL Sunday Ticket and live stream every out-of-market NFL football game this season for $299.95. We’re very excited to see the return of the definitive NFL football app on PlayStation Network. Keep an eye out for the launch of NFL SUNDAY TICKET with the PlayStation Store update on September 4th. A Bears fan who just moved to Michigan couldn’t be any happier! This Bears fan lives in California! It’s an awesome service! Sony please have the app in good working order for the start of the season.Last year was a nightmare for the first couple of weeks. So BEEF Up your servers and have adequate bandwidth Sony & Directv so we can all have a great experiance. Any new features for the 2012 app? such as Fanatasy Team Tracker and NFL Short Cuts. Would be nice to have the Short Cuts feature so we can rewatch our games or scout upcoming opponents from Monday thru Wed. in 30 minutes without commercials. Our expectations are as high as yours are xerokid. All systems look great for kickoffs on Sept 9th! And the game and player stats will certainly help your ff. Sense there doing this why not have it to were we can stream direct tv on our councils remember It Only Does Everything. Any chance of a free trial as a sign of good faith to the users to show it’s not as buggy as it was last year? One more thing: The Bay Area and New York markets should get a discount on this service as they’ll have two teams blacked out. also inb4 foreigners begging for soccer. I was wondering where the app went. I was starting to get worried there. Haha, what a waste. Why do you need to play this from a PS3 (if you already have the NFL package), when it is the same thing on the tv that you hook the PS3 and receiver to? Tell me where this starts to make sense – if at all. @herbalsticky It makes sense when you can use your ps3 as another receiver on Sundays and not get jammed for another $6 a month. @ 11 its really only for the people who dont have direct tv. if your a first time direct tv user then yes, its free all year long. but this deal is specifically for people like me, who move away from their parents house and doesnt have access to direct tv on a daily basis. thus creating the PERFECT opportunity to purchase this for my ps3, cause then i dont even have to watch it at my house, i can take it anywhere. i had this app free last year, because we converted to direct tv, so it was free, but i barely used it on my ps3 because it just made sense to watch it on direct tv last year. this year, full time 100% usage on my ps3. Didn’t buy it last year because the price was a bit steep and had other things I needed to money for. But this year, I’M IN! Can’t stand having satellite because whenever it storms you lose service where I live so this is the greatest alternative ever!!!!!!! Good timing for this year with the lower price! Welcome aboard! The price is still STEEP also. Id pay MAYBE half! Is that the real price or a typo? I like football, but they only play once a week for… 20ish weeks counting playoffs and not pre season? It’s too much for any tv type sports package for only one sport if the price is real, even baseball with 160+ games per team wouldn’t be worth that much for one year. At least not when I know of much cheaper ways to watch, legal of course. Will Sunday Ticket come to Canada this time around? Unfortunately not Biggz124. We certainly don’t want you guys to feel left out. Please know we are working on bringing great services and apps to Canada for your PS3s and VITAs. Thank you, Sony! This is very much appreciated. All I can hope now is that everything goes smoothly with the streaming — I believe I heard there were a lot of issues in the first week last year. But hopefully it’s all smooth and it all goes well on your end. Really looking forward to this season! Does that REALLY say three HUNDRED DOLLARS?? I REALLY hope that’s a typo and supposed to say 29.95 lol cuz if it’s 29.95, I’ll buy it in a heartbeat! If it’s three hundred dollars there’s ZERO chance I’m buying that. That’s more than I paid for my PS3! I love my Green Bay Packers but NO. $299??? it thought they lowered it to $199 as i seen on direct tv commercial. 299 is just crazy.but if you have the money well i guess it your go. GO BEARS! @25 no typo man.. and its not 300 in 1 installment, you pay it in increments, so the breakdown is about 84 bucks a month or so. if u really love football this is more then worth it, especially since no other gaming system even offer it, and only 1 company have rights to the nfl exclusively, direct tv. @yungshep, it is a one time buy this year. Different from last year, but easier for you and us to manage. I love the NFL but at that price ($300.00) with local games being excluded…I’d rather buy a 2nd PS3 or maybe a Vita with Madden instead. NOW: the MLB.TV for $10 to get the rest of a the season is a deal worth considering. Glad to see it return, but it doesn’t make any sense for them not to offer the $199 option without redzone, as they are to regular directv subscribers. 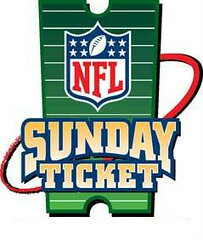 The NFL Sunday Ticket MAX is a requirement to stream on other platforms like say a computer or the PS3. with my basic cable package with no sports or fancy extra channels (only about 30-40 in total) I can already watch 50-75% of NFL games any given week, possibly more. And that’s in Canada, not exactly a big NFL market. I knew the NFL was greedier than most sports but jeeze. Do the math. NFLT only is cheaper. Let’s say that you sign up with DirectTV and the minimum years is a two-year contract. This is pretty typical. So they offer you free NFL Ticket, right. This may sound great because you see the word FREE. Now let’s say for just basic channels, the monthly cost is $50. This does not include taxes and equipment lease costs. So for 24 months at $50, you’re paying at total of $1200. Again, this is before taxes and lease costs. Now, here I am, paying $300 for NFL Ticket only. Done. No on going monthly costs. No lease equipment cost. No locked in contracts. I pay the $300 rate and I’m DONE. Who’s cheaper? I think paying the $300 for only the NFL Ticket is. The numbers dont lie. For someone like me that does not care for cable or satellite channels, the NFL Ticket for the PS3 is a great deal to me and I get to see my team since I’m not in my home town. If you live in town, then both are not a great deal since you can see your local team on the local channels. @TeknoBlast Yes because everyone normally would go out and subscribe to DirecTV service and ONLY watch the football games. Sheesh. Anyways $300 is just totally outrageous. I could consider half that price but It would be an extreme maybe. Considering I can watch most games online within a hour of the games completion if not live. What are you sheeshing about? Yes, a lot people would subscribe to DTV to just get NFLT for free thinking they are getting a better deal, when in truth they are not. So yeah, the $300 rate is not bad at all. Is this the equivalent of the on-the-Go package where I can get it on my tablet, phone, and computer also or just for the PS3? @Ayjent – This is just for the PS3. But you may want to call DTV to make sure. I dont have their service, so wouldnt be able to tell you. That “per month” price was basically 4 payments total. Not 12 months of payments. I do however see the point of you are paying $480/year for cable and not $300/year of NFL and getting more programming choices. But again, for someone that does NOT want other channel options, $300 is not bad. Like myself, I cut the cord two years ago and never looked back. I’m saving by not having cable or satellite. Just to have the service to have all those optional channels that everyone is talking about, the cost would be over $300 easily within a few months. That monthly cost of having all those optional channels, that’s exactly what I DO NOT want. With the service of NFLT through the PS3, I only pay $75/month for four months ($300 total), and I’m are DONE. I dont care for the for your precious HGTV, ESPN, History, or whatever channels you enjoy. Dont know how more simplified I can put it for some of you. I can see extreme and rich football fans buying this. If you want/like it I’m glad for you. I just don’t see the point in spending an extra (for me) 300$ a year to get maybe 25% more games (assuming I don’t go online and watch them for free). YES. Finally. Thank you Sony. Thank you NFL. This is my favorite non-gaming thing on PS3. I love it. 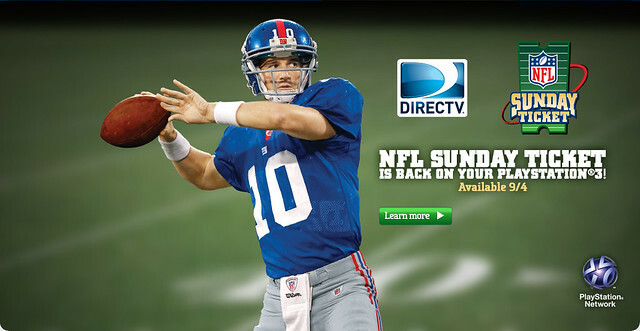 It has been great working with DirecTV to bring this NFL action to you guys. Enjoy the season! i am assuming it will be just like last year with $79.00 dollars a month for 4 months payment plan. This service is great for me since in Dallas all they show on local channels is crappy Cowboys games. Cowboys are not even relevant, how something else please! Wait a second… why did DirectTV announce the price at $250 a few days ago, but now it’s $300??? Do you know if this gives access to the PC/Phone/Tablet app as well? Last year buying the PC package gave you PS3 access but given that the PC package is cheaper this year that doesn’t seem to likely be the case. Was hoping to have access on both PS3 and PC. @PucknNutz – You dont pay $300 all at once. The $300 cost is broken down in four payments of $75/month. I thought the same last year when I signed up for it, then I read the explanation. You should be fine with the four payments. Correction, just read Phil’s comment. I guess it is one big payment. Sorry.